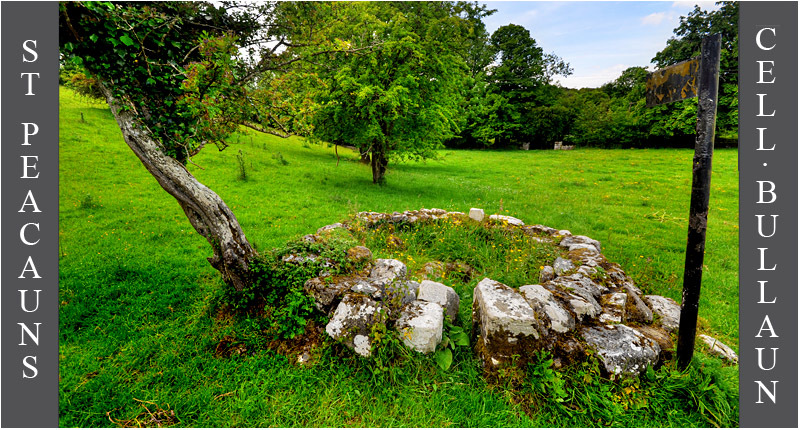 In the field on the opposite of the road to the church is a small circular enclosure. This stone structure is known as St Peacaun's Cell. Believed by some to be a clochan, it was probably built to protect the earthfast bullaun stone, that lies inside it. There are two large bullauns, the eastern one has broken out and the western bullaun still holds water. At one time a cursing-stone/cure-stone known as the 'Butter Stone' used to lie in one of the depressions. It is now located with the cross fragments in front of the nearby church. 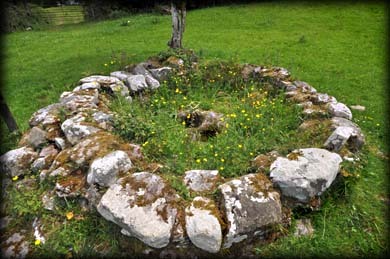 There is a small cross inscribed stone nestled within the wall and nearby is another bullaun stone. Situated: From Cahir head west on the R640. After 1.5K go onto the N24 at the roundabout. After about 5 kilometres turn left onto the L3102. Then take the first left. I parked up and walked over the level crossing into the farmyard. Follow the track from here. Discovery Map 74: S 0059 2855. Last Visit: June 2015.